Friday sweeties!! Friiiiidayy!! We need something special to celebrate so today I'd like to show you lots of beautiful furniture made by a firm called Swedish Interior Design based in Hove, UK. They specialize in antique Swedish furniture pieces and full roomsets. 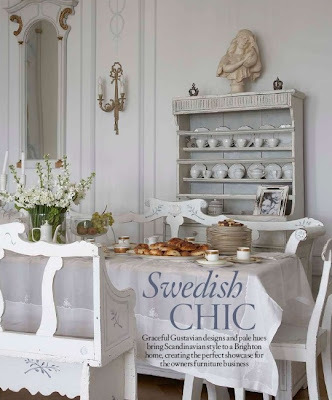 I love all their Gustavian, Biedermeier and country antique pieces and Mora clocks. They design and handcarve furniture and mirrors from antique wood. They even make sleighs! How gorgeous!! They know how to make furniture don't they? How is baby coming along? uau!! marbelous very marbelous indeed..
Guardare queste foto sembra essere catapulti in un'altra secolo... molto belli questi mobili così candidi e carichi di emozioni. my idea of heaven would have all white furniture. these room inspirations are great! This apartment is just gorgeous!!! Love the white and the gold!! Have a great day you, too!!! Thanx for the kind words - we specialise in swedish antiques but we also handmake wonderful one off pieces for our clients too - see more of what we do on the website at www.swedishinteriordesign.co.uk.